Arizona Cardinals cornerback Patrick Peterson is not attending the team's voluntary workouts this week, but head coach Kliff Kingsbury said the Pro Bowler wants to be here and isn't going anywhere despite a trade rumor Tuesday morning. Peterson might not be happy with the front office right now, but he isn't expect to go anywhere. The 28-year-old remains one of the better lockdown corners in the NFL and had 54 tackles, one sack, one fumble recovery, two interceptions and five passes defensed in 2018. New England Patriots restricted free-agent wide receiver Josh Gordon signed his $2.025 million tender on Tuesday. Gordon is on an indefinite suspension for his latest violation of the league's substance-abuse policy, but he'll be back with New England if he is reinstated at some point. The star-crossed 28-year-old played in just 11 games for the Pats last year, catching 40 passes for 720 yards and three touchdowns. New England could surely use the receiver help if Gordon is somehow reinstated before the start of the season. He'll be worth a late-round flier in most leagues this fall for his upside. New Orleans Saints defensive end Marcus Davenport's development was stunted by a groin and toe injury in his rookie season, but the Saints are still expecting big things from the first-round pick. The team moved up 13 slots last year to take him with the No. 14 pick, sending their first-round pick in 2018 and 2019 first-round pick to the Packers. Davenport had 4.5 sacks, a forced fumble and two deflected passes in his 13 games in 2018. He had surgery in the offseason but should be ready for Week 1. He'll be one to watch in IDP leagues if he can stay healthy in 2019. The Baltimore Ravens exercised the fifth-year option on left tackle Ronnie Stanley on Tuesday. The fifth-year option will pay him around $13 million in 2020, according to ESPN's Jamison Hensley. Stanley was the sixth overall pick in 2016 and has been a starter ever since, becoming one of the most reliable left tackles in the league. He was a Pro Bowl alternate last season and graded 16th among all NFL offensive tackles in 2018, per Pro Football Focus. The 25-year-old will be a big help as quarterback Lamar Jackson looks to improve in Year 2. Washington Redskins quarterback Colt McCoy (leg) is missing offseason workouts with the team while recovering from another procedure on his leg, according to a source with knowledge of the situation. McCoy broke his fibula last season in December, and head coach Jay Gruden explained that the team rushed McCoy back for a potential late-season playoff push. The quarterback has now had three procedures on his leg since last December, although he could return as soon as next week. He'll compete for the starting job with Case Keenum in training camp, but the 'Skins could add another QB early in the draft this week. Even if McCoy somehow wins the starting job this year, he won't be an attractive QB2 in fantasy leagues. The Los Angeles Rams picked up quarterback Jared Goff's fifth-year option on Tuesday in a no-brainer move. Goff has thrown for 9,581 yards with 65 touchdowns while completing 62.1 percent of his passes. He's gone 24-7 with a 100.8 passer rating while leading the Rams to two straight NFC West titles in the last two seasons. He hasn't been as consistent as hoped from his fantasy owners, but Goff still has plenty of upside and should benefit from the healthy return of wide receiver Cooper Kupp in 2019. San Francisco 49ers kicker Robbie Gould, who received the franchise tag, said he has pulled the contract proposals he sent to the team and told the club he will not negotiate or sign a long-term deal and wants to be traded. If he reports at all, it will not be before the team's regular season opener. The 36-year-old wants to be closer to his family in Chicago after spending 11 seasons with the Bears. The Niners, however, want and expect Gould to be with them in 2019. The veteran kicker made 33 of his 34 field goals (97.1 percent), including nine of 10 from 40-plus yards, in 2018. Despite his age, he remains a solid fantasy kicker, but it remains to be seen if he'll be kicking in the bay area this year. Denver Broncos cornerback Chris Harris Jr., who has been absent from the team's voluntary minicamp, has requested either a new deal or a trade, according to NFL Network's James Palmer. The cornerback wants at least $15 million a year on a new contract, which would make Harris the highest paid player in average annual value. The 29-year-old is in the final year of his current deal and is scheduled to earn $7.8 million in base salary. 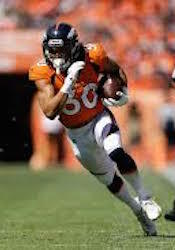 Harris is coming off his fourth Pro Bowl season and has become the heart and soul of Denver's secondary. The Baltimore Ravens signed kicker Justin Tucker to a four-year extension worth $23.05 million on Wednesday, the team announced. It'll come with around $12 million guaranteed, NFL Network's Ian Rapoport reported. The contract is the most money ever handed out to a kicker. Tucker has his third All-Pro first-team nod in 2018 after he made 35 of his 39 field-goal attempts, and he's made 90.1 percent of his kicks in seven seasons, which is the highest rate in league history. His lone miss in 242 extra-point tries came last season. The Pittsburgh Steelers finalized a two-year contract extension for quarterback Ben Roethlisberger on Wednesday, the team announced. Financial terms of the deal weren't disclosed. He was entering the final year of a four-year, $87.6 million extension that he signed in 2015. The 37-year-old will remain a Steeler up to his 40th birthday. While Big Ben was a high-end QB1 in 2018, he could disappoint this year with both Le'Veon Bell and Antonio Brown leaving. Oakland Raiders running back Marshawn Lynch plans to retire, a source informed of the situation told NFL Network's Ian Rapoport. The Raiders plan to move on, and Lynch doesn't want to play for another team. The team plans on selecting a running back early in this week's draft, and Alabama runner Josh Jacobs, considered the top back in the draft, could be their target. Beast Mode had four straight seasons of 1,200-plus yards with the Seahawks. Injuries caught up to the 33-year-old last year, but he ran for 891 yards on 207 carries (4.3 average) with seven touchdowns in 2017. As of now, Isaiah Crowell, Jalen Richard and Deandre Washington are tops on the team's running back depth chart. Baltimore Ravens PK Justin Tucker agreed to a four-year, $23.05 million extension Wednesday, April 24, which makes him the highest-paid kicker in the league. He receives $12.5 million fully guaranteed in the first two years and an $8 million signing bonus. Fantasy Spin: Tucker is a solid PK1 to target in the final rounds of drafts. Updating an earlier report, Pittsburgh Steelers QB Ben Roethlisberger agreed to a two-year extension Wednesday, April 24. Financial terms weren't disclosed, but the two years will be added on to the final year of his deal. We hope you are enjoying your free trial. Your free trial ends in 159 days. Keep your league active for the entire season with our subscription service.